“The EU and Turkish convergence or cooperation is essential to stabilising the Middle East (ME), however, there is no joint mechanism or framework on how they should do this over a wide range of issues,” said Kamaran Palani, co-author of a recent MERI policy papers, titled Turkey and the European Union: Conflicting Policies and Opportunities for Cooperation Over Iraq, Syria and the Kurdish Political Actors and EU and Turkish Energy Interests in the Caspian and Middle East Region. 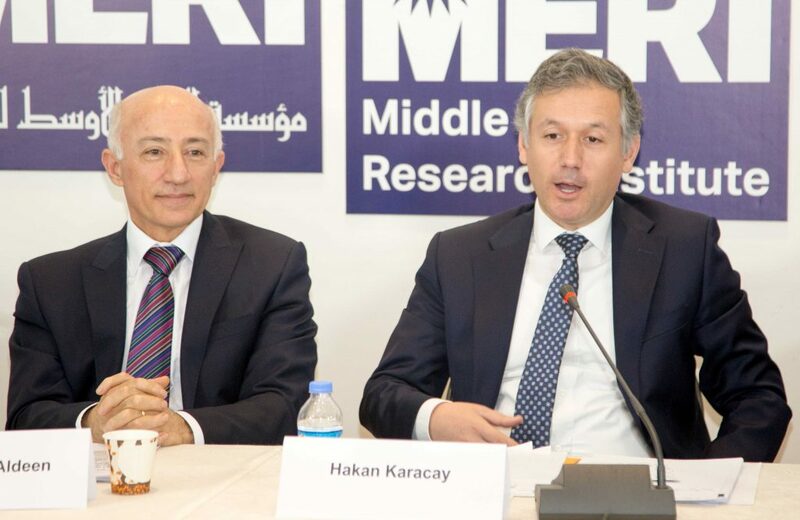 The authors, Kamaran Palani and Dlawer Ala’Aldeen, presented the papers in a special roundtable discussion on 19 March 2018, attended by European, Turkish and other diplomats as well as local policy makers, politicians and academics from Kurdistan Region. The first paper discusses how the security and political developments in Iraq and Syria have the potential to influence Ankara-Brussels relations; while the second paper identifies Ankara and Brussel’s energy drivers in the Middle East region and Caspian Basin. Iraq and Syria’s proximity to Europe also directly exposes the EU to Middle Eastern instability. Contiguous neighbours to Turkey, these countries also dramatically sway Ankara’s, and by extension, Brussels’ domestic and foreign policy interests and priorities. Issues, events and trends from Iraq, Syria and the Middle East and North Africa region, at large remain geopolitically vital for the EU. Europe hosts large and growing migrant communities from ME states, disputes and dilemmas from this region resonate more intensely than elsewhere. However, the EU-Turkish relations are not completely determined by disagreements over the dynamics in Syria and Iraq including the roles of non-state actors. Both the EU and Turkey may agree on certain overarching principles, but they deploy different approaches on the ground; Turkey’s approach is “confrontational and the EU’s is cooperative”. It remains questionable that this relationship will last, given the complexity of the dynamics. Although security and political developments play important roles in EU- Turkey relations, nevertheless, domestic and human rights matters seem to add further complexities. Further, Turkey is concerned with the absence of a unitary position within the EU member states regarding its accession to the EU and its presence in Syria and Iraq. Turkey holds a similar stance with regards its military offensive in Syria, justifying it as a “self-defence mechanism and a response to the threats made toward its national security interests.” In addition, Turkey also does not seem to separate between the (Democratic Union Party) PYD and the PKK due to the perceived organizational and ideological links between the two. Thus, Ankara’s military engagement in Syria and Iraq is shaped by the policy to counter the presence of the PKK in both regions. This position may not be shared with certain EU member states, however. France, for example, has been one of the most vocal critics to Turkey’s military operation against the PYD in northern Syria. Turkey-Russia relations are of importance to EU and Turkish security policies, perceptions and priorities. Russia’s interests and objectives to reduce US and EU influence in the ME has already driven a wedge between Ankara and Brussels. However, Ankara’s relations with Moscow and other actors, such as Iran, are explained through the “multi-dimensional logic and basis of the Turkey’s foreign policy and geopolitics.” Turkey’s geopolitics enables it to cooperate with different forces from the East and the West, including Russia. Turkey’s rapprochement with Russia has added further problems to the already strained relations between the EU and Turkey. In this context, the EU is asked by Turkey to understand Ankara’s geopolitical interests in the region; and importantly, its multi-dimensional foreign policy should not be seen as a threat to its relations with the EU. For the moment, Turkey-EU relations are more likely to remain as it is, though contingent upon Russia’s roles in the ME proper. Over the past 10 years, Turkey-KRG rapprochement was often labelled as one of the best examples of conflict transformation in the region. One participant stressed ‘’Kurdistan has always been a strategic depth for Turkey and should remain as such.’’ Yet, despite this, Turkey strongly opposed the KRI’s September referendum. Clearly, the referendum has created serious tensions between two close partners in the region. Turkey called the decision to hold the referendum a ‘’grave mistake’’ and vowed to pursue punitive measures. However, a KRG politician said ‘’we were aware of Turkey’s concerns over the referendum, but at the same time we were also very clear that the territorial integrity of Iraq should not be maintained at the expense of Kurdish rights.’’ What is important now is that there is still a strong economic and security rationale in being in close cooperation for both sides. Additionally, the normalizing of ties is ongoing and there is a political will from both sides to cooperate over a wide range of issues. Unlike the security and political drivers, there are multiple energy drivers which strategically incentivise the EU and Turkey to cooperate and converge on overall political and economic policies and priorities. As European consumers seek greater energy security and the ME is poised to supply the EU and Turkey with the lion’s share of their oil and gas needs, Turkey is ideally situated to bridge the Eastern supply and Western demand. This symbiotic relationship provides additional incentives for cooperation and/or convergence in the short, medium and long term. However, Turkey and the EU must first shift from conflict to cooperation and/or convergence on larger geopolitical issues regarding migration, counterterrorism, the war in Syria, Turkey’s enhanced relations with Russia and Iran, and Turkey’s domestic politics. While, cooperation between the EU and Turkey in the energy sector remains the most likely scenario in the medium and long terms, opportunities and challenges for both sides loom large. Opportunities include not only further diversification of gas sources and routes for both European and Turkish consumers but also an increase in economic returns for supplier and transit countries in the ME. Meanwhile, challenges include possible Russian economic and political pressures, and attempts to destabilize supply -and transit- countries in order to hinder cooperation between Turkey and the EU. The stakes are high, and the prospects of the ME serving as a provider of energy security for both the EU and Turkey and an enabler of their deeper cooperation remain unclear. Overall, the EU and Turkey must prioritize mending cracks and fissures in their relationship and focus on the gains to be made through rapprochement on security issues originating in Iraq and Syria. Likewise, the EU can use its tremendous mediating capacity as an honest broker to settle entrenched disputes between warring parties. More than ever, both must develop a long-term strategic security framework to ensure that bilateral security interests, priorities and interventions do not derail current stabilisation and reconstruction procedures in Iraq and/or progress toward a durable peace in Syria.